Close to four million passengers make the 25-minute crossing between the islands of Malta and Gozo each year. Just a 45-minute drive from Malta International Airport, the new Ċirkewwa ferry terminal offers an hourly service to the neighbouring 67sq km island, promising visitors spectacular views of the Gozo Channel and the nearby island of Comino en route. Tourism is one of the main pillars of the Gozitan economy. The island’s government is committed to attracting more tourists for longer stays over the coming years, focusing on its distinct, resplendent landscapes and the appealing Mediterranean climate that makes it an attractive holiday destination all year round. The island offers an array of outdoor activities, including diving, kayaking and rock climbing. The Gozitan calendar also embraces traditional festas throughout the summer season, followed by a series of operas hosted by the main opera theatres of Victoria in October. Other influential annual festivals include the Mediterranean, and the Gaulitana music festivals. 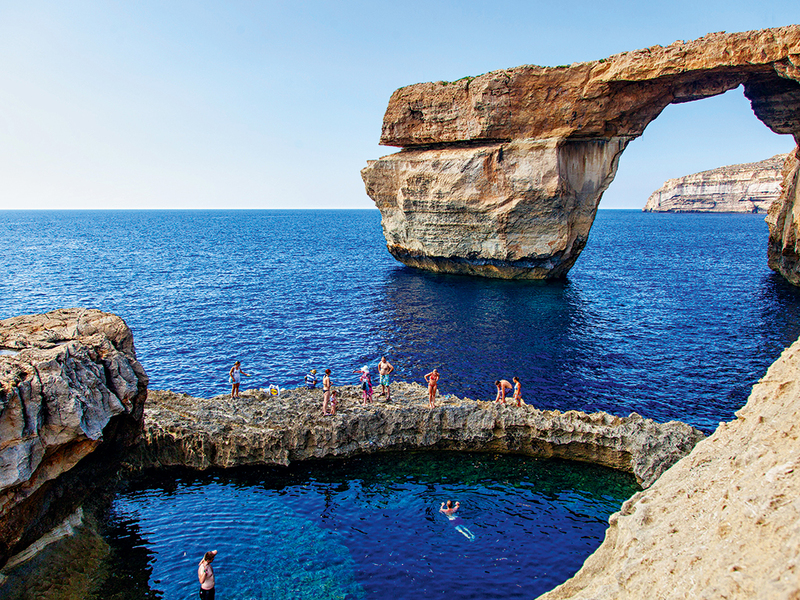 The island’s breathtaking scenery and exquisite views have also contributed extensively to Gozo’s economy. In particular, the Azure Window in Dwejra has been the backdrop for a variety of movies and television series in recent years; featuring in Game of Thrones, Clash of the Titans and The Count of Monte Cristo. Additionally, in 2014 the secluded bay of Mġarr ix-Xini was used in the motion picture By the Sea – directed and scripted by Angelina Jolie. Gozo is also demonstrating ambitious targets with regards to sustainability. The Ministry for Gozo’s eco-Gozo action plan was the first step in the island’s aim to become a fully sustainable ‘eco island’ by 2020. The vision focuses on all spheres of life on the island, where the Ministry acts as a leading force cooperating with and uniting all contributing stakeholders. The future looks exciting for this idyllic island. The Ministry for Gozo is becoming increasingly aware of the island’s potential for investment. Plans to improve the island’s transport links and connectivity are now underway: these include the development of a cruise liner terminal, a yacht marina and improved air links. The Ministry for Gozo also aims to progress in other areas over the coming years, including the hosting of high-level meetings, conferences and events. Part of the island’s attraction stems from its deep-rooted culture of hospitality, and the government is keen to make the very most of this potential in the foreseeable future. The recent decision for an established software company – specialising in hi-tech payment systems – to open its newest office in Gozo is evidence of the fact that today’s interconnected world has provided new and unique opportunities for previously unfamiliar locations such as Gozo. The island has also been chosen as the location for a new medical school that will be established under the prestigious marque of Queen Mary University of London. Malta Enterprise provides significant investment benefits, which have added additional incentives for companies to invest in Gozo. A combination of its opportunities for growth and its tranquil Mediterranean lifestyle has seen the island being increasingly acknowledged as an ideal place in which to do business. As a number of projects targeted at sustaining and enhancing the island’s economic progress take their first steps, it seems that the future truly is bright for Gozo.